Do you ever find that you are out and about and need to freshen your breath? I have and the first thing I usually dig in my purse for is gum. Minty gum is best. I have never been quite sure how the fruity gums freshen your breath...maybe it is because they taste good and make you smell "fruity"? So, gum is my first choice when it comes to freshening my breath. Wrigley Gum has been a long-time favorite for many and it's no wonder why...thy have some of the best gum EVER! I do purchase this gum for my self all the time and it is usually in my purse. Wrigley also manufactures mints, hard and chewy candy, chocolate and lollipops. 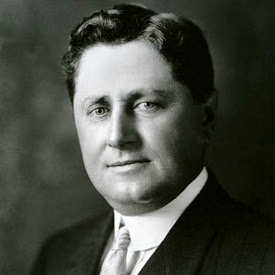 William Wrigley Jr. came to Chicago in the spring of 1891. He was 29 years old, had $32 in his pocket, and possessed unlimited energy and great talent as a salesman. He started out selling soap. As an extra incentive to merchants to carry Wrigley's soap, he offered them free baking powder. When baking powder proved to be more popular than soap, he switched to the baking powder business. One day, Mr. Wrigley got the idea to offer merchants free chewing gum with each can of baking powder. The rest is history. Mr. Wrigley was definitely on to something when Wrigley chewing gum was born. I think that gum is something that will never become out-dated! The innovations and genius of Wrigley keep getting better. I recently found out that Wrigley has a "program" for a product called MyExtra Gum. 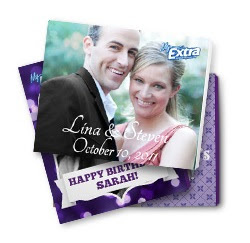 MyExtra Gum is a way for you to create your very own CUSTOM PACKS of gum. When I say custom, I mean you can add your own photos, fonts and editing to a pack of gum. This is soo great. Talk about endless possibilities and the ultimate in gift giving. I am and always have been a fan of personalized gifts so this was a wonderful discovery for me! Who doesn't love a pack of gum...especially when it has your very own photos on it! So, for this review I was given the opportunity to design my very own 5-pack of MyExtra Gum. This process is very simple. All you do is pick a theme that you want for your pack. Themes basically are Father's Day, Birthday, Easter, Baby, Friends, etc. There are many from which to choose so you definitely have options. Then, you can pick a template: how do you want your pack to look? This is where you can choose your layout. Next, you get to edit your pack. This means that you can add font, move it around to where you want it, add pictures, add clipart, etc. VERY EASY. Now, when I went to create my pack I did everything right but when I went to add my photos from my computer, they did not show up. Thinking that I did everything right I went ahead and placed my order...with my photos not showing. I thought that maybe I wasn't meant to see them and that maybe there was an issue on the other end. Soo, I ordered my pack. I received a very nice phone call a few days later from MyExtra stating that they needed to speak with me about my order. When I called them back, everyone was SO nice and very patient. I told them about the message I received and they immediately connected me to the proper department. I have to say here that their customer service is the best. Not only did they help me troubleshoot my project, they also gave me tons of tips along the way and did not hang up with me until I was finished. I was VERY impressed. To me, at the point you are having issues with a company and they take good care of you shows that they CARE about their customers. So, my 5 packs of MyExtra Gum arrived the other day and I am SO thrilled with my order! 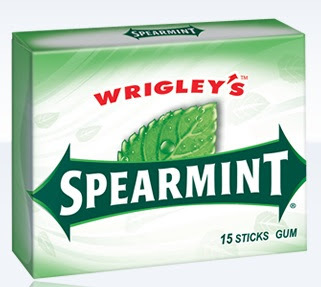 I was able to choose what flavor of gum I wanted and I chose Spearmint...my favorite! I also had a choice between Sweet Watermelon and Peppermint. These packs of gum are soo cute! I was able to choose as many photos as I wanted and also was able to arrange them myself too. So, in my opinion...MyExtra Gum is a wonderful product from Wrigley! I love how you can design your own pack and really personalize it to fit exactly what your need is. The process through which you create your packs is simple and if you have ANY problems whatsoever, their customer service is AWESOME. I loved this product and the opportunity to do this review. Disclaimer: I received no monetary compensation for this post. I did receive 5 Packs of MyExtra Gum for review purposes. All quotes are from the MyExtra Gum and Wrigley websites and email. All thoughts and opinions are 100% mine. I love their gum, but $5/pack is a bit much to order often. A special occasion definitely would be best. Pretty neat though! I had no idea they offered this! this is a really neat idea! hubby has started chewing gum to help him quit smoking and creating a custom pack with our daughter's picture would be something really neat to do for him. What an awesome idea! I am definitely going to have to check this out for our next get together - what a great idea. The story of how Wrigley's gum started is fascinating! I love this gum! hose picture packages would make for a cute little gift forthegrandparents or to giveaway as a birthday souvenir. Totally funky. What a fun idea for party gifts!! !